Today’s concert features clarinetist Sam Boutris and pianist Tomer Gewirtzman. 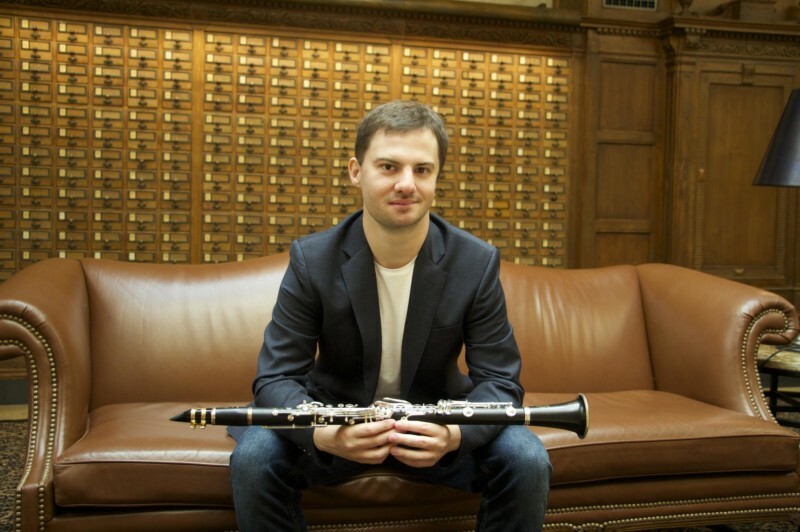 Clarinetist Sam Boutris was recently awarded a master of music degree from Yale university. He also holds a bachelor of music degree from the Curtis institute of music in Philadelphia. Boutris has a number of engagements planned for the 2017-2018 concert season. This August, he will be in Burlington, VT for the Vermont Mozart Festival. While there, in addition to serving as a member of the orchestra, he will appear as both soloist and conductor in a performance of the Mozart Clarinet Concerto. Immediately following his residency in Vermont, Boutris will attend the Lake George Music Festival in New York where he will perform the Brahms Clarinet Quintet and play in the festival orchestra. In the fall, he will again perform the Mozart Clarinet Concerto as soloist with the Yale Chamber Orchestra. A series of guest masterclasses classes and recitals at universities along the east coast is planned throughout the calendar year, including events at SUNY Fredonia and Ithaca College, among others. Most recently, Boutris performed the Nielsen Clarinet Concerto at Yale University. The performance was of a unique arrangement that he worked in close artistic collaboration on with composer Rene Orth. This project was the result of his own commission and was ultimately premiered with the Curtis Chamber Ensemble. A native of Fort Worth, TX, Boutris began his orchestral studies as a member of the Fort Worth Youth Symphony. Since then, Boutris has been a member of the Curtis Symphony and Yale Philharmonia and has performed many concerts in collaboration with musicians from America’s top orchestras, allowing him to engage with orchestral musicianship of the highest level. He has rehearsed and performed under the baton of many renowned conductors including Charles Dutoit, Yannick Nezet-Seguin, and Giancarlo Guerrero, among others. Boutris has made appearances as soloist with orchestras across the nation, and has also participated in a number of music festivals across the globe spanning from Dresden’s annual music festival to Carnegie Hall’s famed New York String Orchestra Seminar. These collaborations and others have lent Boutris the opportunity to perform in close quarters with world-class artists including Joseph Silverstein, Roberto Diaz, and Noah Bendix-Balgley. Starting in the fall of 2017, Boutris will take a position in the prestigious artist diploma program at the Juilliard School in New York.